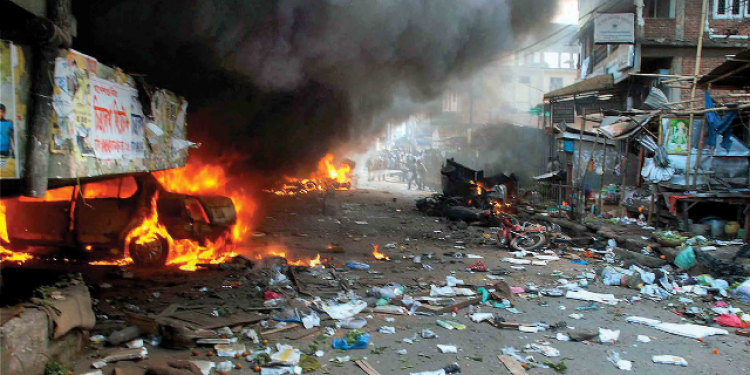 Two teenage tribal girls were killed in a bomb blast triggered by suspected militants in Manipur’s Noney district on Friday. The bomb exploded when the two sisters had climbed the mountain near their Leisok village to fell trees for doing shifting cultivation. Police officials said the victims have been identified as Akhiuna Kamei, 17, and Gaikhonlieu Kamei, 15. “The elder sister died on the spot while the younger one succumbed to the injuries on the way to hospital. Their mother was also injured and had to be hospitalised,” a police officer said. The bodies were taken to Imphal for post-mortem. Police suspect that the bomb might have been buried there to attack insurgents of rival outfits. Some armed groups are active in the mountains of this district. One report said the bomb appeared to be of World War II vintage.